Though its my personal portal and being a Nepal Telecom Employee, my portfolio must include NT website at the very top. I've been doing most of the NT website developings (both public & Internal purpose) for past 5 years. I've done number of advertisement designs for the company. Still web designing, updating is my main job here. Currently in leisure, I'm keeping myself busy with www.websansar.com own by Mr. Hari Krishnan K Sharma. It is an archive covering news from all sectors especially Sports, News, Music, Movies, Technology, Health, Entertainment etc. One of my recent design is NEPCEMAC (Nepal Pollution Control and Environment Management Center). NEPCEMAC is a non-profit making and independent organization that has been working in Solid Waste Management (SWM) with communities since its inception. Also, it has begun new adventures to work in the areas of health and education. NEPCEMAC targets contributing to sustainable social development through environment, health and education efforts. The other one NZ Patches belonging to Mr Doug & Mrs Kate Clendon is one of my simple and favorite site. The natural beauties from The New Zealand captured in those stunning photographs really kept me going enthusiastically through out the project. Its a dynamic site about the patches designed to explore the natural beauties of New Zealand. 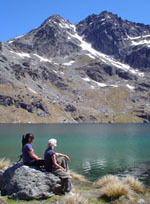 New Zealand is a world focus for outdoor adventure, particularly hiking, trekking, walking and mountaineering. Tramping routes range from well-formed tracks to challenging remote wilderness trails. To ensure conservation and recreational use of the diverse environment, 30% of New Zealand�s land area is designated as national parks and reserves. The embroidered sew-on patches, inspired by the wonderful natural landscape and unique wildlife, feature the alpine wilderness of the Southern Alps, the North Island�s Volcanic Plateau, rugged coastlines, rainforest and tussock grassland, cascading rivers and serene lakes.